The name of the village, as Matthias Schönberger noted in his chronicle, probably came from the combination of two words : “wag” or “vag” for water and “rain” for slope, riverside or embankment. So Wagrain literally means “slope on the water”. Others make the connection between Wagrain and the two Roman watchtowers which once stood in the village (Wagrain = guard the slope). The early history of Wagrain is still unknown. Under Roman rule, the infrastructure of the Celtic Noricum was developed and the old mule tracks were extended. A Roman road therefore went from the south (Carinthia, Katschberg) via Altenmarkt to Pfarrwerfen in the Salzach valley. A turnoff from Altenmarkt went via Reitdorf, Genigau, Lackenkapelle and Ginau to the road through the Salzach valley. Watchtowers along the way ensured safety, including the two which were found in the area where Wagrain stands today. One is still used today as the foundation of the parish church, whereas the other was erected on the hill of the old fortress. In the 12th and 13th centuries, the rulers of Goldegg became vassals and owners of Hofmark, Wagrain. They were also thought to be the builders of the fortress, which was then destroyed in 1322/1323 and was never rebuilt afterwards. The first documented references to Wagrain were found in the Salzburg book of place names. 16 years later, sources also make reference to the church. In 1285, the small market town was fully established and in 1382, a judge was appointed in Wagrain. When the ministry officials of Goldegg died out in 1400, the settlement became the property of the local ruler and got its own district court. Soon afterwards, Luther’s Ninety-Five Theses were urging people to follow his propositions throughout the mountain valleys of Salzburg. In 1524, the first ban of the Theses was decreed by the church council. Strict punishments and exiles from the country followed both during and after the time of the Peasants’ War. Under Archbishop Leopold Anton Freiherr von Firmian (1727 – 1744), openly practising Protestants were targeted and in 1731/32 his emigration decree banished them from the country. Approximately three quarters of Wagrain’s inhabitants had to emigrate. They mostly went to East Prussia, Holland and America. This had a lasting effect on Wagrain’s further development. It was only 230 years later that the population size of Wagrain was finally bigger than it had been before the expulsions. 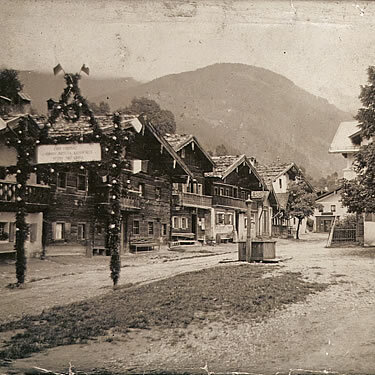 Until the middle of the 19th century, the inhabitants of Wagrain lived mainly from mining, agriculture and through traffic, such as the many freight caravans from which local salespeople and innkeepers profited. 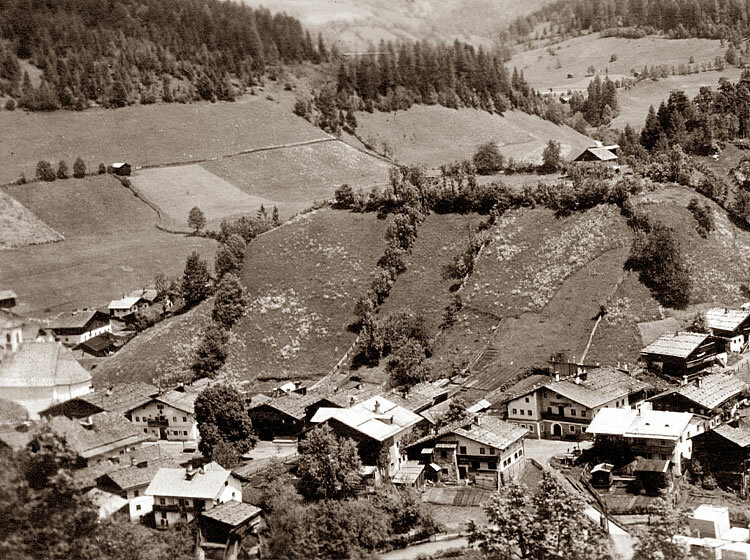 With the construction of the railway line through the Gastein Valley at the beginning of the 20th century, this source of income was suddenly severely reduced and the town fell into poverty. In 1927, a devastating fire destroyed a large part of the buildings in the market place and this intensified the hardship of the inhabitants even further. Three men - Karl Heinrich Waggerl, Josef Reisenberger und Linus Hochleitner – focussed on the promotion of tourism and did everything in their power to encourage this. The quiet seclusion of the village began to attract more and more visitors in search of rest and recovery to Wagrain. By 1937, visitors were coming from all over Europe and even from overseas. 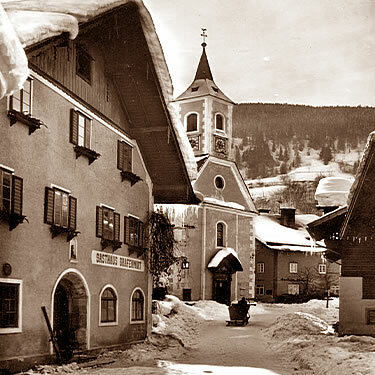 The introduction of the 1000 Mark Ban in 1933 affected the village negatively, as German tourists were then only allowed into Austria upon the payment of 1000 Marks. At the end of the Second World War, tourism recovered again. The first mountain cable car was built in 1949, thus laying the foundation for the future of Wagrain as a tourist destination.